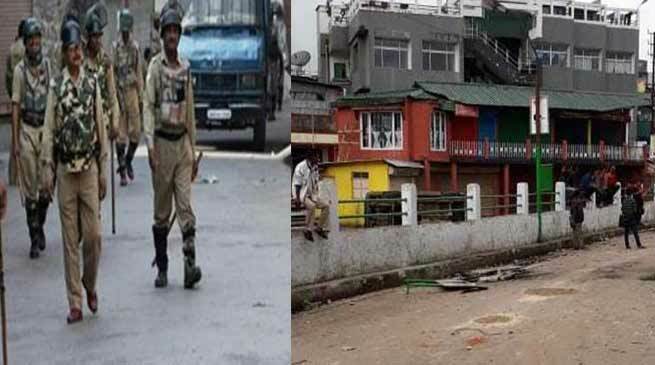 Curfew imposed in some parts of Shillong city, the capital town of Meghalaya after a clash between the police and mob in the city’s Motphrant, Mawkhar and some adjoining areas. “The curfew was promulgated at 4 am on Friday in Jaiaw, Mawkhar, Umsohsun, Raitsamthiah, Wahingdoh, Mission, Mawprem, Lumdiengjri, Lama Villa, Qualapatty, Wahthapbru, Sunny Hills, Cantolment and Mawlong Hat,” said Deputy Commissioner Peter S Dkhar, adding that it will continue till further orders. According to the police, a clash broke out between Shillong Transport Public Service (STPS) drivers those residing at Them Iew Mawlong (Sweeper’s lane) on Thursday morning. Meanwhile, by evening, rumours started doing rounds on social media that a local resident had died in the clash, which enraged people, who started marching towards the locality. The situation soon turned volatile with an unruly mob of over 100 people pelting stones at police personnel deployed in the area. As the matters turned worse, more forces were requisitioned and anti-riot vehicles and fire tenders were rushed to the area. police were forced to open tear gas to disperse the mob as they had started pelted stones at 50 police personnel stationed in Motphran, and also tried to set police property ablaze. Unable to control the mob, Meghalaya police set up barricade at G S Road and prohibited entry and exit of vehicles in Motphran area. The officers had to rope in more armed police by midnight, but were unable to pacify the mob, following which the curfew was imposed early on Friday morning. According to news agency IANS, a journalist and four civilians were also injured in the clash.